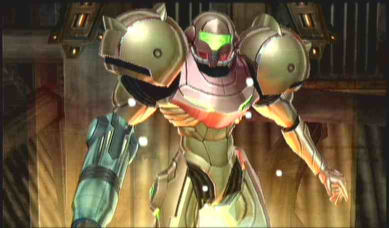 i’ve been meaning to post a review of the soundtrack to the great metroid prime for a long while now. as i mentioned before, listening to the same video game music in and out of the game makes for two very different experiences. in this case, in the game the music is quite fantastic, but outside, though still enjoyable, i found it to be much less so. [Koji Kondo paraphrased:] The balance between sound effects and music. Left and right positioning balance. Sound effects in the level dictate the notes used in a song. Important sound effects should be the most clear, other sound effects should blend more. although it’s been a while since i’ve played the original NES game, i think i know what this writer is talking about. the very sections he disliked are the ones i enjoyed the most, and i found them to be wholly appropriate. the original game was all within lava-filled caverns, etc. and the graphics and music were dark and foreboding to give a closed, close feeling. however, in metroid prime many of the environments are on the surface of the planet beneath an open sky saturated with light. the “upbeat” music seems quite appropriate accompaniment for light rain falling on forest greenery, soft snowfall over icy ridges, or dimly lit areas deep underwater. one may argue that the game should’ve made the alien planet itself more threatening, but i think the harshness of the environment and its denizens were perfectly accounted for by the earthy sound effects. definitely a much less alien environment than it could have been, but quite beautiful. anyway, one more quick link: a guy called stemage has been doing metal covers of metroid songs. on his website www.metroidmetal.com there are 3 metroid prime covers. all three are very well done and well worth checking out, and even if like me you usu. don’t listen to heavy metal you may well find yourself putting these tracks on repeat. he also has a myspace page. lastly, if you’re looking for a copy of the original soundtrack, you can buy an import copy from here. ← how do you say “dream job”?